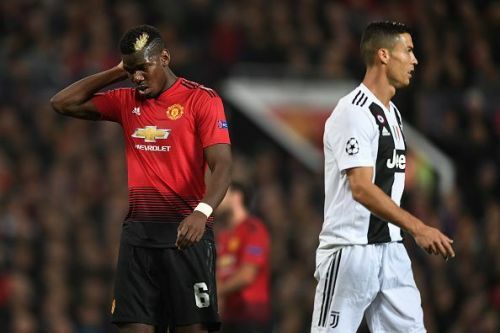 Former Manchester United coach Rene Meulensteen has slammed comparisons between Paul Pogba and former Red Devil Cristiano Ronaldo, stating that there are no parallels that exist between the two players. Ronaldo, who moved to Old Trafford in 2003, hogged the limelight under Sir Alex Ferguson despite being surrounded by legendary teammates. The Portuguese forward won an array of titles with the side before moving to greater and better things at Real Madrid. Meanwhile, Pogba's career with the Red Devils has been marred with inconsistent performances and in-house feuds. Since returning to the club in 2016, the Frenchman has been heavily criticized for his below-par displays and his row with then-manager Jose Mourinho. Under new boss Ole Gunnar Solskjaer, the midfielder appears to have found his place in the team, having scored 16 goals so far this season. However, recent reports have linked the 26-year-old to Real Madrid, prompting some fans to draw parallels between him and Ronaldo. "I don’t think there’s any parallels there at all and I’ll tell you why." "When Cristiano Ronaldo came, he came for the right reasons. At this club, it shaped him and formed him under the guidance of Sir Alex Ferguson and the players around him." "But he was clearly an ambitious guy. He made that clear to Sir Alex and they had a good chat about it. They agreed he would stay for another year – that’s what he did. When you look at the performances he produced that season, they were fantastic." Speaking about Pogba's situation, the 55-year-old said, "This is different. The speculation that comes up all the time – where is it coming from? Is it from Paul, an agent?" "Sometimes, we stand here and speak about something that couldn’t be further from the truth. It’s not always fair on the player." Both Juventus and United are getting ready for the second leg of their respective quarter-final fixtures against Ajax and Barcelona in the Champions League this week.